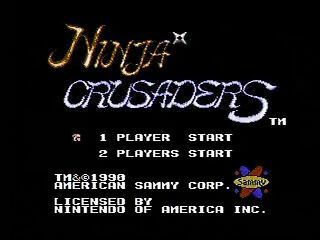 Released in December of 1990 for the NES, Ninja Crusaders stood out amongst the many ninja-themed side scrollers by offering a 2 player co-op mode and a weapon transformation feature that allowed the player to take the forms of various animals and beasts. It's often compared, and then looked down upon, as a Ninja Gaiden clone regardless of the differences between them. There's also not much of a story to be seen in this game, but since when did a ninja need an excuse to look awesome? Shoutouts to Infested Riche for smashing the old record and BadBrakes for pushing me to lower the time. This run is nearly perfect, I think the max for this game would be low 4:46, I don’t know that a human could go as low as 4:45. In order to get the time so low I had to find lag reduction strats for most of the levels. This run beats the old SDA time by over a minute. Most of that time comes from major routing changes compared to that old run. There is almost no time that I’m not holding right on the dpad in the run. The only mistake was in 4-1, I accidentally jumped too high on a platform and had to stop for a fraction of a second. The only other possible time saves are in 3-2. I skip doing a 1 frame jump in the middle of the stage and I hesitate at the end to setup the good pattern at the door, it is possible to do that without slowing down, I believe. As far as I’m concerned, unless something is found, this game is dead, only frames left to save. Really happy to get a run this low. Thanks for watching!